How to repair corrupted Phison PS2251-07 or PS2307 or UP307 Chip controllers .Download Phison PS2251-07 USB recovery tools fro free now . How to fix corrupted Phison PS2251-07 Chip controller ? 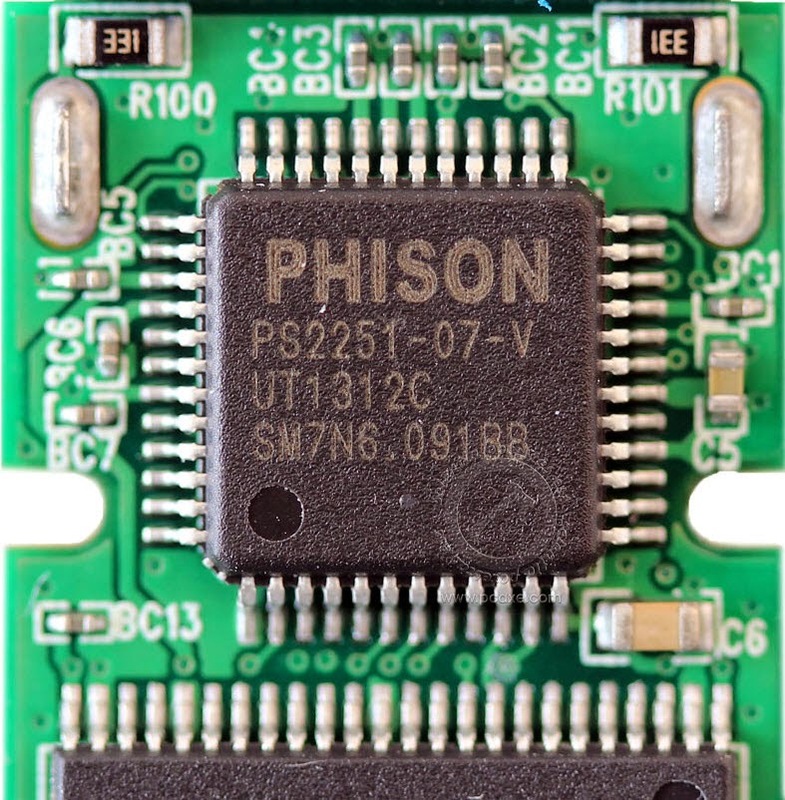 First we must be sure that our USB flash drive chip vendor is Phison PS2251-07 or Phison UP307 or Phison PS2307 "all this chip vendor is the same PS2251-07 " .To be sure of that please use the Chip Genius software report . You will find chip vendor is Phison and chip vendor model will be PS2251-07 . 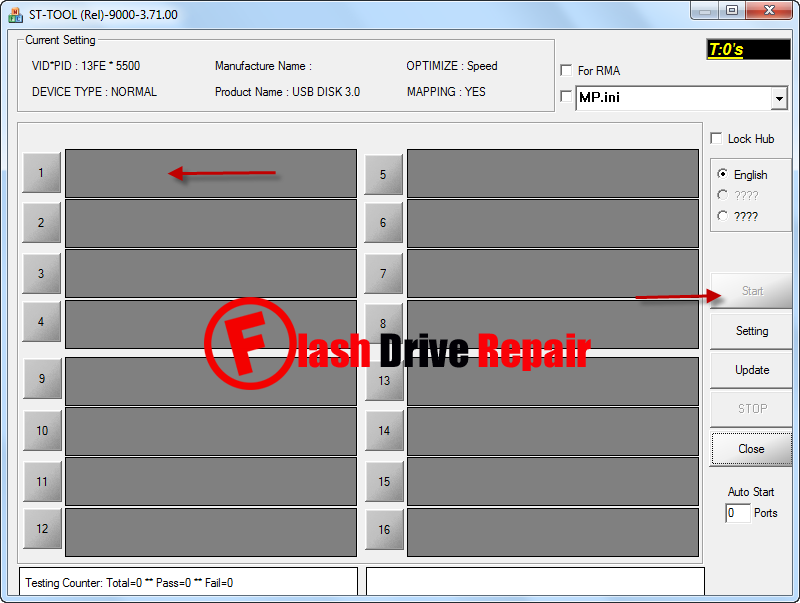 First use Phison ST Stool software ,insert your Corrupted usb stick to your PC then if this software is the correct software , you will find your flash drive information appear on Phison ST Stool software .Now Click Start to begin updating your USB flash drive firmware . Second , If the previous software doesn't fix your Phison PS2251-07 Flash drive so please use the next software "Phison Low Level formatter " .Try using the Recovery software in the Phison PS2251-07 Zipped Folder . Tried the SD-TOOL, it sees the drive, but when I click start it just sits there and does nothing. The timer counts up and that is about it. I tried the tool on a working PS2251-07 and the same results. What could be the issue? Ashraaf, getting the same problem as everyone else has complained about. I opened my USB drive case to see the activity light and it never lights up on all three versions of the software you just linked. If I try to use a low level format program in the originals article's files, the activity light will light up, stay up, and it will give an error. That is the most I've seen it do. User the Restore-v3.13.0.0 and just select Restore. That should be fine for these minimally secure drives. I am trying to put Write protection to Kingston data Traveler with Phison PS2251-07(PS2307). Using MPFALL program and setting Write Protect, the Start Command produces Sub id Error 0x1042 [CS]:0x350DE1AC and no change to the stick. I expect to generate a USB Flash Drive thas has some video on it and is write protected so that the final user cannot erase or format the drive. Please help me. ¿How can this achived? Thanks in advance for your help. Dear Ashraaf, please help us! I've got the same error as the others: the timer counts up but that's all. Any solution to the blue label Dell KR2H9 disks? Dear, not working for me either. Tool returning following error in red box. someone has solved the problem with dell 8gb usb ?? Not yet...none of this stuff worked! Is it possible to extract firmware of one USB and write it to defected USB? I have a Patriot Supersonic Rage 2, that's uses a PS2251-08. PID: 13FE VID:6000 The latest version of MPALL (v3.71) doesn't support the PS2251-08, is there a newer version? I have tried it on my FD kingstone G3.. Does anybody know why are a lot of u s getting Error ID Issue 0002 in red box? 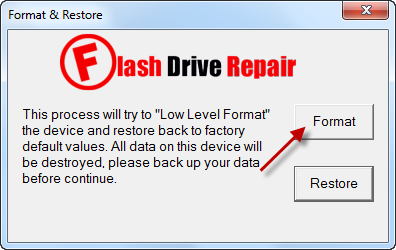 I try many times to re-flash or formatting (Kingston DT100 G3 16GB) with this firmware with out any result .. except losing whole default firmware and totally disappear from windows or any formatting tools. Can you solve this problem ? Greetings Ashraaf, It would be nice if you pleas could help me to fix my usb memory , the features from Chip genius 4.0 are as follow , I´ve tried to fix it with UPtools but not work . thanks and congratulations for your great Blog. The TOOL works great.. It's just that, my 32GB became 28GB now.. So I've lost 4GB. But the thing is it's on SUPER SPEED which is so freaking great.. Fast transfer.. The tools you guys see on this web works really fine.. You just have to find the right tool for you USB. Dead USB can be revive with the tools here.. Find the right tool and make sure you guys have a better understanding on how to run those tools before starting to flash firmware. Coz it will brick the chip for life.. RIP USB when it happens.. Thanks again to those who created and share ideas on how to fix USB.. Specially DISK WRITE PROTECT..
Hi, i've tried with some tools and nothing happens, could you please helo me with tips? i kind'a mess up with the experiment using various combination of uptools and mpal, and mixed up firmware and burner file too. could you please help me with the correct variant? Did someone managed to fix the drive? I have Kingston datatraveler 100 g3 32gb? Hi, I faced the same problem. I have a 32GB OTG micro drive (manufac: Verbatim) as when plugging in windows automatically starts to install the drivers for 'PRAM 2307 USB device'. It doesn’t have any icon appeared in my computer and in Disk Management 'Removable Disk' shows no information beside it. How can I get windows to recognize the drive? Please email to me at colin_lim85@yahoo.com. Thank you. My mistake whose I format with Low Level Format Utility from Phison PS2251-07 USB recovery Tools > preformat application. From the moment of finished format I face with situation written above. Now I’m afraid to don’t brick the CIP of OTG. If there is someone to help in order to revive that OTG information’s are highly appreciated. write protected solve by Low Level Format Utility. works for my 32gb toshiba PS2251-07, thanks a lot for sharing. Where can i get the Firmware of this 64GB it says"Please insert a disk into a Removable disk"
Need your help the format tools above not working. First of all i have to say that this is a great-detailed tutorial! I followed all steps but i got errors. i have a write protected 64GB usb drive which i would like to format and use it again as a usb flash drive. Could you please help me step by step to format it? I would appreciate very much to recover, format, or revive the USB drive. Thanks in advance. I have a phison ps2251-07 (VID 13FE PID 5500) with the wrong firmware installed. Now the stick is recognized by windows, but can not be started (error 10), in mpall the stick is not recognized. The LED is permanently lit. All repair tools do not find the stick. What else can I try?